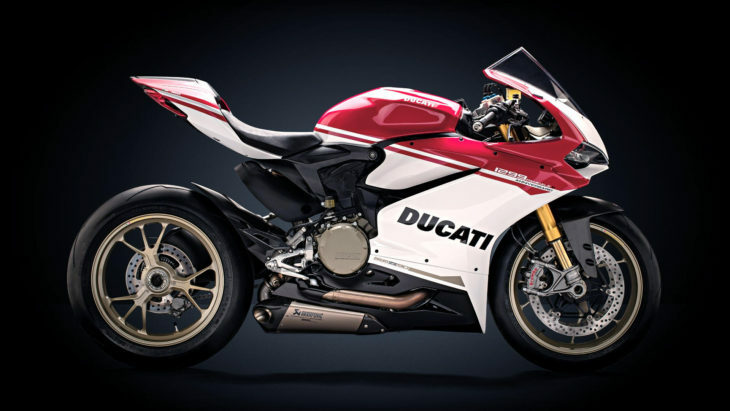 At World Ducati Week, this past weekend, Ducati rolled out a limited production 1299 Panigale S Anniversario, primarily a graphics treatment to the existing Panigale 1299 S. Casey Stoner took some laps on the bike, and you can see a video of him riding it below. Much of Ducati’s focus this weekend was Jorge Lorenzo, the current MotoGP champion who will join the Ducati Factory Team next year. 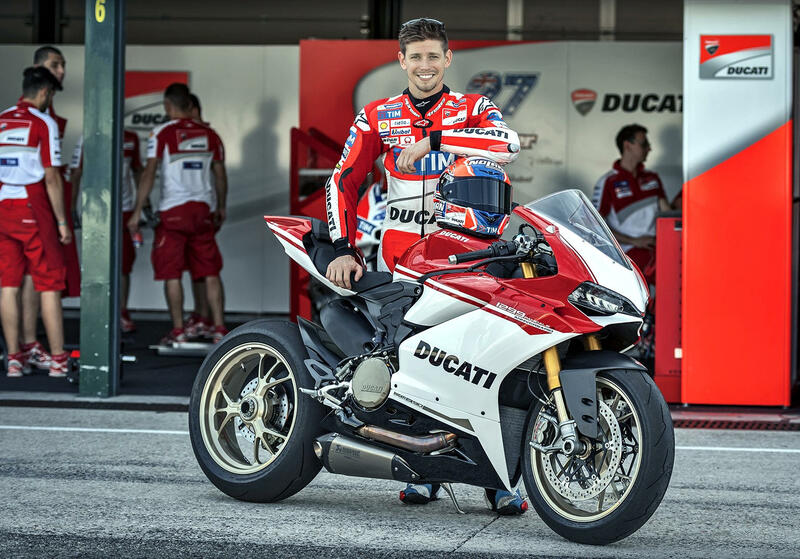 Casey Stoner, himself a double-MotoGP champ and current Ducati MotoGP test rider, said he is looking forward to working with Lorenzo closely, and helping develop a winning motorcycle platform for him. 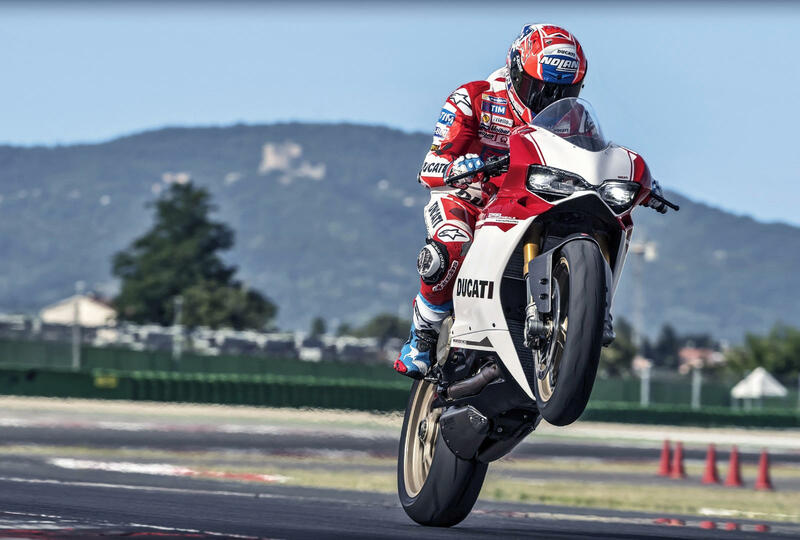 Have a look at the beautiful new sport bike from Ducati, and take a look at the video of Stoner below. Utterly useless on the street. I can actually ride my CB500F and either short shift or wind it out and get into the heart of the motor. My brother has a Ducati and every time you open it up you are beyond illegal. “Excessive” is the intended theme of the bike. Just a different graphics package, but it does wonders for the look of the bike, IMO. Same with the similar package applied recently to the Pikes Peak Multi. Shame its only those limited production models getting the treatment. I think they would do well to allow it as a regular option. That’s a “BIG TWIN” they’ve got there! Since when Ducati became a CHICKEN? Remember Ducati 996s? They’d often put a four cylinder Jap Rocket to shame, same about 1098… But now they’re kinda CHEATING, really! I agree, it getting ridiculous. Next Ducati will keep bumping displacement til its a 1999 or something. How about a 1000 limit in WSBK across the board? Then Ducati would be forced to release a V-4 1000 to compete..just like MotoGP.. The Ducati twins in WSBK are “only” 1199s. As long as they don’t win all the time I really don’t care how big they are. Restrict them to 1000cc and then there wouldn’t be any Ducati twins in WSBK which would be sad. I’d rather see Superbike at 800cc fours, 900cc triples and 1000cc twins and drop Supersport to just 750cc twins but that won’t happen either. That Anniversary S is a beauty even if I’ll never put a leg over one. With that being said, I don’t want Ducati to go V4… EBR 1190RX is gone, so is KTM RC8R and RSVs… So, I’m glad that Ducati is still committed to V-Twins, but this yearly displacement hike is rather ridiculous! The 916-998 generation of Ducati superbikes raced against competing 750cc inlines and V-4s. There has (almost) always been a displacement advantage for twins, going back to at least Raymond Roche and Doug Polen dominating the World Superbike class and continuing on through Carl Fogarty etc. There was a 5 year period a decade or so ago when 1000cc was the displacement limit, regardless of number of cylinders. Interestingly enough, Ducati still won the championship 3 out of those 5 years. The whole idea of displacement limits is stupid. Set limits based on displacement multiplied by maximum RPM. I don’t care if you make 230 hp by spinning a low displacement engine very fast or a very large displacement engine slowly. Let the engineering determine what engine configuration is optimum. Somehow the EVO TC system introduced for this bike was completely ignored. Check out Asphalt and Rubber for the real story. Clearly Ducatisti still love Stoner, because Chaz is the one that should have got some publicity for his development of the Panigale in WSBK. Well said, was waiting for someone to speak up! Kinda weird seeing a Duc with Akra instead or Termi pipes. Pretty bike nonetheless. Special edition to add to my collection of bikes, hooray! Nope. I can afford dozens of bikes, I stick with my ’08 V-strom. Thanks for asking though..
What is a (minus one percenter)-1%er? And let me guess your V-Strom is a 650 right. Since when did this site become over run by pretentious snobs? WTF cares if he has a 650 or the 1000? If he is on two wheels that is all that matters. Yup, its a wee-strom. How’s you guess? Can’t wait to see the end product…! I’m guessing there’s a press embargo at the moment. Oh man! She’s a beauty.